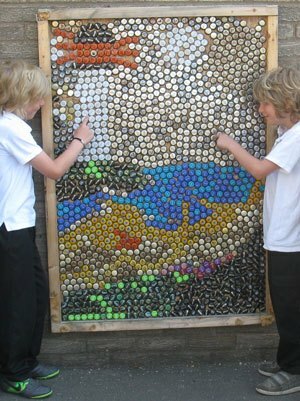 Edwin Street First School Head teacher Joyce Jenkins invited The Ambler to see a mosaic made out of beer bottle tops that the pupils recently had great fun creating. The tops had originally been collected to make shakers for percussion instruments, but they had collected so many that they had to think up another way of using them. The design features a lighthouse, and all the children were involved to some degree. Initially, the tops had to be sorted into colours, which was probably the most difficult task as some of the tops had sharp edges. A frame had to be made to mount the piece, and there was lots and lots of glue involved. Mams, dads, grandparents and some of the local hostelries were commandeered to top up the stocks when particular colours were in short supply, and there was one special bottle top, placed right in the middle of the lighthouse light, which had come all the way from Kenya. This was from a tipple the staff had enjoyed during their exchange visit to their link school last summer. The mosaic now takes pride of place in the school playground.